The Ladies’ Mile Historic District, an assortment of grand department store buildings, lofts, and early skyscrapers, is the product of a successful campaign for designation in the 1980s. The district contains a myriad of beautiful Beaux-Arts, Neo-Renaissance, Romanesque Revival, and Queen Anne style department stores, loft buildings, and several incarnations of early skyscrapers. Much of the architecture was a direct reflection of the City Beautiful Movement, inspired by the Chicago World’s Fair in 1893. The area served as a vibrant social center for shoppers, diners, and entertainers and was described as having a “champagne sparkle.”3 It was also the home of the literary giants Edith Wharton and Washington Irving. 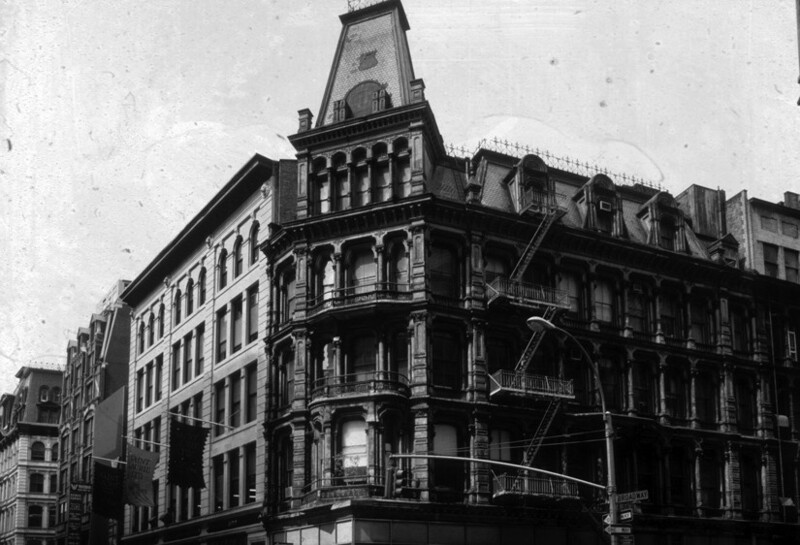 The area originated as a commercial district in 1862, when A. T. Stewart moved his department store from Lower Manhattan to Ninth Street and Broadway. Other stores soon followed this trend by moving into the area and eventually taking up a generous portion of the district. In 1878 an elevated train, called the El, was constructed on Sixth Avenue, further promoting more commerce to an already thriving area. The development in this neighborhood followed a pattern of specialized mixed-use. Broadway served as an entertainment center with concert halls, galleries, restaurants, and department stores like Lord & Taylor and Arnold Constable.4 Sixth Avenue served as a later retail center with department stores such as B. Altman, R. H. Macy, and Siegel-Cooper, while Fifth Avenue became a center for office buildings. The economic prosperity once found in the Ladies’ Mile district would soon vanish, as stores began to move uptown and the economic downturn of the Great Depression reverberated across New York City. After World War II, the area became dilapidated and vacant. However, during the mid to late 1980s, the area was revitalized as new business owners and advertising and publishing firms re-inhabited the area.6 The Ladies’ Mile Historic District was officially designated by the New York City Landmarks Preservation Commission in 1989 and continues to encapsulate its historic charm for new shoppers and retailers. The Ladies' Mile Historic District was designated in 1989 by the New York City Landmarks Preservation Commission, and still serves as an area for retail stores in New York City. It was the 1986 demolition of the four-story brownstone which housed the Athenaeum Club for the literary community that galvanized these groups and their urgent approach for designating the district.3 Developers reached an agreement with preservationists who were against the design of the 21-story condominium to be built where the former club once stood. The developer agreed to top the building with a mansard roof in order to harmonize the new construction with the historic styles analogous to the Ladies' Mile district. Home Page of The Drive to Protect the Ladies’ Mile District. Article retrieved 12 February 2016. Dennis Hevesi, “When Computer Store Meets Historic District,” The New York Times, 3 August 2005. “new york architecture walks- Ladies’ Mile,” New York Architecture 12 February 2016. David W. Dunlap, “On Ladies’ Mile, Homesteaders Amid Past Glory,” The New York Times, 5 June 1986. ”Loving Ladies’ Mile,” The New York Times, 8 September 1986. Karen Mathiasen, Interview with Jack Taylor, 13 October 2007. David W. Dunlap, “Historic District Being Weighed For Retail Hub,” The New York Times, 11 June 1986. “Loving Ladies’ Mile,” The New York Times, 8 September 1986. “Ladies’ Mile District Wins Landmark Status,” The New York Times, 7 May 1989.